One week Alan appeared as a solo pianist at Cafe Prag. The next week he was joined by Bryan on tenor and soprano sax. The Cual on percussion. Then Cathy Gordon on vocals. Then Ray T on alto sax and someone on guitar. 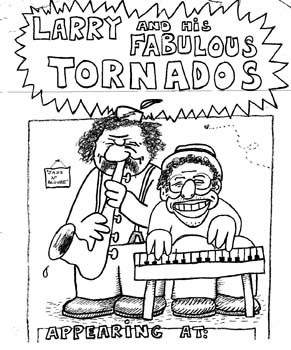 That was Larry and his Fabulous Tornados. As the band grew, the Cafe could no longer afford to give the band free beers, and the $25 paid had to divided into smaller and smaller shares. No, no one in the band was named 'Larry'. (Poster by Shem).